Aggrecan is the major proteoglycan in cartilage, and is degraded by aggrecanases. 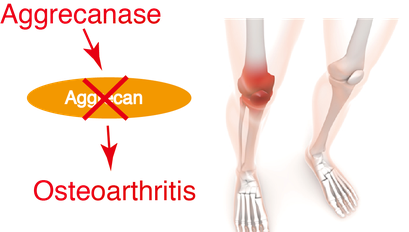 Aggrecanase has been reported to play a key role in the pathogenesis of osteoarthritis (OA). We have developed the assay system (Aggrecanase Test) for the quantification of aggrecanase. Our assay indicates high level of the blood aggrecanase leads to the diagnosis and prognosis of OA.